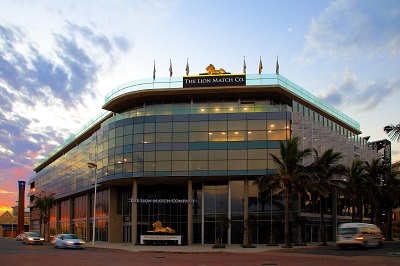 One of Durban’s first settled areas, the historic Point Precinct, is now home to a contemporary new building: the iconic headquarters of The Lion Match Company! The first new building in Mahatma Gandhi Road (Point Rd) in decades, this R80 million new Lion Match Company head office includes a five storey, 5 000m² mixed use development made up of a 2000m² distribution warehouse, corporate offices, retail space and covered parking. Originally located in landmark premises in Umgeni Rd, when its proximity to residential areas was no longer appropriate for health and safety reasons, The Fasic Investment Company who bought The Lion Match Company from South African Breweries in 2001, relocated the match manufacturing plant to Rosslyn, Pretoria. However, there was still a need for state-of-the-art offices in Durban and The Lion Match Company became the first blue chip company to put down roots in the Point Waterfront. Chairman, Mr Gora Abdoola had a strong idea of what he wanted and design of the new premises was awarded to Durban-based architectural firm, Emmett: Emmett Architects cc who were charged with creating a new iconic home for The Lion Match Company. The practice which is renowned for providing sustainable architectural solutions has worked on a number of restoration projects in the area as well as contemporary designs and was the ideal partner on this project. Design of this multifunctional building started in 2013 and took nine months to complete with traffic studies determining the early planning decisions. Explained Trish Emmett, “The distribution centre is serviced by extremely large vehicles which need a wide turning circle. The largest of these are 22m long interlink double trailers with a height of 4,3m and a turning radius of 12m. This had an impact on the massing of the building.” The entrance to the distribution centre is 13 metres wide with an eight metre interior height for racking. “Our plan was to create another significant building. To this end we have included in the design three golden lions which are a critical part of The Lion Match Company’s identity: the lion on the ground floor in the forecourt roars on the hour and the other two are at the entrance to the offices on the second floor and on the roof, said Abdoola. Other elements from the original building in Umgeni Rd were also incorporated into the new design. The main staircase linking the ground floor to the offices is semi-circular as a memory of the original staircase, however, in a nod to the new modern design a 12-metre water walls runs down the centre of the stairs. Because of the harshness of the environment, materials were chosen specifically for their low maintenance qualities. The structure is concrete with brick infill, the curtain walls are glass and highest quality stainless steel as well as galvanised steel has been used in the construction. Because of its hardwearing qualities, matt grey granite was used on the floors. Erected in two phases, first the piling then the actual construction of the building, certain requirements presented a number of challenges. For example, the distribution centre needed to be operational long before the offices were completed which meant ensuring that people working in the distribution centre were safe while it was still a construction site. And, fire prevention requirements were onerous. Large underground water storage tanks were required and fire escape routes had to run from the roof to the ground floor, serving the offices and the distribution centre. The 12,7650mm x 1250mm aluminium fins were a collaborative effort between Emmett Architects and Bernice Rumble from Land Art Studio. Rumble developed the design of an ocean wave which was used and briefed the aluminium manufacturer using the perforation options which they’d provided. Emmett Architects detailed all the technical fixings. Other green elements include a rear north facing wall which has been designed as a green wall with mesh panels on which creepers will be encouraged to grow. And, the decking is recycled plastic with a maintenance free lifespan of more than 15 years. And, with the building being Universal Access compliant, The Lion Match Company’s new headquarters are designed to be aesthetically pleasing as well as usable to the greatest extent possible by everyone, regardless of their age or ability. With decks that wrap around each floor and clear view fencing around the north east fire escape stairwell the spectacular harbour views have been well accommodated and maximised. And, the roof garden which is seen as a definite usable area has been designed to be a well-considered space to look over the neighbouring buildings and 360 degree view. Astro turf, glass balustrades and attractive paving all contribute to making the roof a desirable space. Facilities include: nine paraplegic toilets, one on the ground floor and two on the other four levels; two prayer rooms (one each for men and women); a kitchens and toilets on each floor; three boardrooms, half a dozen meeting rooms, conference and a private gym for staff. “We have created a home for The Lion Match Company for a long time to come, which adequately takes care of its long term vision for growth,” said Abdoola. A selection of photographs is available. Contact Shirley with your request.